Asolo Drifter vs Fugitive - which is better? OK, here’s what you need to know: Asolo’s Drifter hiking boots are superior to the Fugitive in nearly every way. They’re wider, more comfortable, more hi-tech, lighter, and have better traction and ankle support. Not quite. When we say better, more comfortable, etc, keep in mind these are both high quality hiking boots for the more serious backpackers and thru-hikers, meaning the differences are marginal. 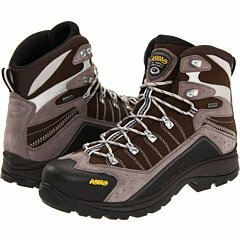 Furthermore, Asolo is in the top three or four brands in the hiking boot world, so you know they’re not pumping out poor quality products. The ​Drifter has a molded EVA midsole for long time support and comfort, and while the ​Fugitive is also quite supportive, it’s not quite as supportive as the ​Drifter. Both of these hiking boots are designed to be lightweight, about as lightweight as hiking boots can be. This is of course beneficial because you don’t want to be wearing bricks on your feet as you are trying to cover ground. With that being said, the Asolo Drifter is a little bit lighter than the Fugitive. In other words, the Drifter is a better choice for long distance hiking, especially if your legs are not used to going the distance. Another thing that you need to keep in mind is that the fit on both of these boots is radically different. If you have fairly narrow feet, the Asolo Fugitive is probably the better option to go with. It is especially narrow in the heel and toe, which can be a problem for some people; it fits more like a running shoe than a hiking boot. However, the Asolo Drifter is fairly wide and fits exactly as a hiking boot should. Since the Drifter is wider, it comes with the added benefit of being a little more stable. Both the Drifter and the Fugitive are made with a suede and nylon outer, and both have a Gore-Tex lining. Gore-Tex is great because it is totally waterproof and will not let water in at all. Now, the difference here is that the Asolo Drifter is quite soft and flexible, especially right out of the box. For this reason, many people enjoy the Drifter due to the increased comfort and reduced need to break it in. On the other hand, the Asolo Fugitive comes out of the box quite stiff, and it stays that way more or less forever. It could be because the Fugitive may be a little more durable, but the fact that it is a lot stiffer than the Drifter remains the same. Another big difference between both of these hiking boots is that the Asolo Drifter comes with a molded EVA midfoot insole. This is a big advantage because it serves to absorb a lot of impact, it is soft, and it keeps your arches well supported. It is a good option for long-distance hiking where arch support is crucial. This is not to say that the Asolo Fugitive does not have good midfoot support, because it does. However, the support is just not as good as it is with the Asolo Drifter. We do feel the need to say that both of these hiking boots are top quality, and the differences we are mentioning here are really quite minimal. Both of these boots have a good outer sole with fairly good traction and durability, but there is a slight difference. The Asolo Drifter has a Vibram outsole which is specifically designed to provide great traction, to be flexible, durable, and to absorb impact. While the Asolo Fugitive does have a good outer sole, it’s not a Vibram sole. Both of these boots use Gore-Tex as a lining. In other words, both of these boots are fully waterproof, which is important if you are going to be hiking in the rain or in wet areas. Don't believe us? Check out the video below..
​​​​Asolo Drifter vs Fugitive - How Do They Compare? ​​Another good quality – and reasonably popular – men’s hiking boot is Lowa’s Renegade GTX (​link to Amazon). Made in the USA, these boots have a wider fit so definitely consider them if you’re not sure about the slim-fit often experienced with the Asolo range (but remember, the Drfiter is a bit wider). Apart from that, the Renegade generally doesn’t come close to living up to the Drifter or Fugitive. They lack the ankle support found in Asolo boots, and the Renegade does not have the same level of comfort as either the Fugitive or the Drifter. The LOWA Renegade GTX is a nice looking leather hiking boot, but at the same time an oversized toe-box and poor lacing system let down an otherwise decent option for weekend hikers. ​​​​​​​​Asolo Drifter vs Fugitive: Our verdict ​- ​If you’re more than weekend backpacker and are about to put in some serious mileage...do yoursself a favour and stop what you’re doing right now, drive to REI and geab a pair of ​Asolo Drifters. You won't regret it - these boots are designed with you in mind, and very well too for that matter. Comfort and support should be at the top of your wish list, and the Drifter delivers these in abundance.